The backwaters and sea of the South Asian peninsular landmass is rich in actinides. The actinides would have formed scaffolds for the formation of RNA viroids, DNA viroids, isoprenoid organism and prions on actinidic surfaces which would have symbiosed to form archaea and eventual multicellular organisms. The bonobo Lemurian monkeys would have evolved into homo neanderthalis by archaeal endosymbiosis in the actinidic shores of backwaters, lakes and oceans of peninsular India. 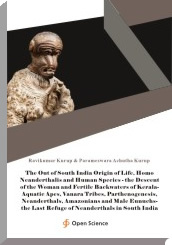 The homo neanderthalic possibly arose in the Lemurian oceanic landmass supporting the theory of the aquatic ape origin of humans. The neanderthalic behaviour can be compared to the promiscuous behaviour of the bonobo monkeys or lemurs seen in the ancient Lemurian continent. The bonobo monkeys owing to shortage of food would have started foraging the backwaters and sea for fish and tubers of water lilies. The fish contains essential fatty acids like docosa hexaenoic acid and tubers contain plenty of carbohydrates. The essential fatty acids and carbohydrates would have increased the brain growth. The brain growth in humans is called encephalisation. The aquatic ape and homo neanderthalis would have evolved in the actinidic sand shores of backwaters and lakes of Lemuria and peninsular India.